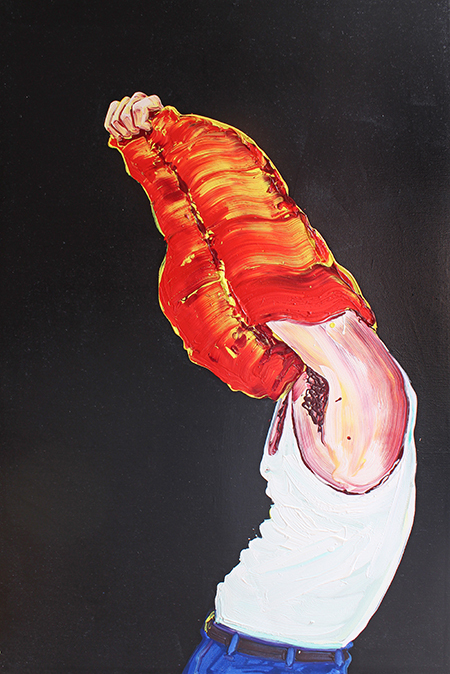 Cornelius Völker, "Pullover," 2000, oil on canvas, 86 5/8 x 59 1/8"
Cornelius Völker can make any subject enticing, as he demonstrates in this survey of work from the last fifteen years. The German artist explores the traditional genres of still life and portraiture, with a sometimes strange (or perhaps to some, humorous) twist, uniquely luscious brushwork and lively color. Among the subjects depicted are a pistol, crushed cigarettes, clothes strewn about and a partially used and open tube of toothpaste — discards that all share an engaging beauty. The oil paintings are heavily impastoed and handled so as to create movement. Notable here is “Pullover" (2000), which depicts a side view of a male figure from the waist up caught just at the moment before his shirt is pulled over his head. The brushstrokes of the orange and yellow garment covering his arm and head strongly spiral in toward each other — think two tornadoes side by side — leaving you expecting to see the action finish at any moment. Völker’s color use results in unexpected juxtapositions, and they work. A great example is “Oysters" (2004), which features oysters on the half-shell and two slices of lemon. For the shellfish Völker utilizes yellows, blues, turquoise, purples, and various other surprising colors to delightful effect, so voluptuously as to make one’s mouth water. While all of the works are representational, the image may read ambiguously or brush up against becoming abstract. In four works titled “Puddle" (all 2012) blobs and smears of jam could easily be read as clotting blood stains. “Lips" (2005), a large, close-up of the luscious red lips of a woman that, from a distance meld to create the image, but close up the picture begins to break apart. Throughout, it is clear that Völker is a master of his craft. He maintains a high degree of control over how the paint will behave and mingle, but his is clearly an organic process that conveys spontaneity.